Two days after the opening of Chakravyuh, the Hindi romantic comedy Ajab Gazabb Love hits Chicago area theaters. Ajab Gazabb Love opens on Friday, October 26, 2012, at the Big Cinemas Golf Glen 5 in Niles and AMC South Barrington 30 in South Barrington. It has a listed runtime of 1 hr. 59 min. Chakravyuh continues the run it began on Wednesday at both of the above theaters, as well as the AMC River East 21 in Chicago and Regal Cantera Stadium 17 in Warrenville. Its runtime is listed as 2 hrs. 32 min. After collecting $326,508 in its opening weekend in the U.S., Student of the Year gets a second week at all four of the theaters mentioned above. English Vinglish — with U.S. earnings of $1,670,773 so far — gets a fourth week at the Cantera 17 and South Barrington 30, which is also holding over OMG Oh My God for a fifth week. Last weekend’s other new release, Delhi Safari, failed to earn a second week in theaters. After six weeks, Barfi! finally vacates area screens, with total U.S. earnings standing at $2,799,445. Other Indian movies playing at the Golf Glen 5 this weekend include Trivandrum Lodge (Malayalam) and the Telugu films Cameraman Ganga Tho Rambabu and Dhenikaina Ready. This entry was posted in Weekly Theater Updates and tagged 2012, Ajab Gazabb Love, AMC River East 21, AMC South Barrington 30, Barfi!, Big Cinemas Golf Glen 5, Bollywood, Cameraman Gangatho Rambabu, Chakravyuh, Chicago, Delhi Safari, Dhenikaina Ready, Earnings, English Vinglish, Friday, Hindi, Indian, Malayalam, Movie, Niles, October 26, OMG Oh My God, Regal Cantera Stadium 17, Runtime, Student of the Year, Telugu, Trailer, Trivandrum Lodge, Warrenville on October 25, 2012 by Kathy. Looks like my fears of a prolonged Bollywood drought were unfounded. Two new Hindi films open in Chicago area theaters on October 19, 2012. Getting the wider release of the two is director Karan Johar’s Student of the Year. SOTY opens in five area theaters on Friday: AMC River East 21 in Chicago, Regal Gardens Stadium 1-6 in Skokie, Big Cinemas Golf Glen 5 in Niles, AMC South Barrington 30 in South Barrington, and Regal Cantera Stadium 17 in Warrenville. It has a listed runtime of 2 hrs. 30 min. Also making its debut is the animated film Delhi Safari. Note that the version releasing this weekend is in Hindi, voiced by Indian actors like Akshaye Khanna and Boman Irani. Fandango‘s capsule description of the movie includes the information for the English-language version of the film releasing on December 7, featuring the voices of Jane Lynch and Cary Elwes. Delhi Safari opens on Friday at the Golf Glen 5, South Barrington 30, and Cantera 17. It has a runtime of 1 hr. 50 min. If you need added incentive to see the film, take a picture of your Delhi Safari ticket stub and you can win a $50 Toys R’ Us gift card. The charming English Vinglish continues to perform well at the box office, having earned $1,405,758 in its first two weeks in U.S. theaters. It carries over for a third week at the Golf Glen 5, South Barrington 30, and Cantera 17. The South Barrington 30 also holds over OMG Oh My God for a fourth week and Barfi! for a sixth, with is total U.S. earnings standing at $2,779,172. Other Indian movies playing at the Golf Glen 5 this weekend include Cameraman Ganga Tho Rambabu (Telugu), Damarukam (Telugu), Maattrraan (Tamil), and Trivandrum Lodge (Malayalam). The subtitled trailer for Vishal Bhardwaj’s Matru Ki Bijlee Ka Mandola is out. The film — which stars Imran Khan and my girl crush, Anushka Sharma — releases theatrically on January 11. This entry was posted in Weekly Theater Updates and tagged 2012, Akshaye Khanna, AMC River East 21, AMC South Barrington 30, Barfi!, Big Cinemas Golf Glen 5, Bollywood, Boman Irani, Cameraman Gangatho Rambabu, Chicago, Damarukam, Delhi Safari, Earnings, English Vinglish, Friday, Hindi, Indian, Karan Johar, Maattrraan, Malayalam, Matru Ki Bijlee Ka Mandola, Movie, Niles, October 19, OMG Oh My God, Regal Cantera Stadium 17, Regal Gardens Stadium 1-6, Runtime, Skokie, South Barrington, Student of the Year, Tamil, Telugu, Toys R' Us, Trailer, Trivandrum Lodge, Warrenville on October 18, 2012 by Kathy. Update: The Big Cinemas Golf Glen 5 in Niles finally posted its weekend schedule, and the theater will carry the new Hindi films Aiyyaa and Bhoot Returns. (Note: I don’t live anywhere near this theater, so I won’t be reviewing either of these movies, unfortunately.) The Golf Glen 5 is also carrying English Vinglish and OMG, as well as the Malayalam movies Molly Aunty Rocks! and Puthiya Theerangal, Maattrraan (Tamil) and its Telugu version, Brothers. The steady stream of Bollywood movies flowing into Chicagoland has finally dried up. There are no new Hindi movies opening in Chicago area theaters on Friday, October 12, 2012. I’m especially disappointed that I won’t get to see Rani Mukerji’s Aiyyaa, but Ram Gopal Varma’s Bhoot Returns, Chittagong, and Makkhi seemed like potential candidates for screenspace as well. Still, a few Bollywood options remain in local theaters. After posting impressive first-weekend earnings of $745,414 in the U.S., English Vinglish carries over at the AMC South Barrington 30 in South Barrington and Regal Cantera Stadium 17 in Warrenville. Both theaters are also holding over OMG Oh My God for a third week, while the South Barrington 30 gives a fifth week to Barfi!, which has earned $2,692,161 in the U.S. so far. Starting on Friday, the South Barrington 30 will also carry the Punjabi movie Saadi Wakhri Hai Shaan. This entry was posted in Weekly Theater Updates and tagged 2012, Aiyyaa, AMC South Barrington 30, Barfi!, Bhoot Returns, Big Cinemas Golf Glen 5, Bollywood, Brothers, Chicago, Chittagong, Earnings, English Vinglish, Friday, Hindi, Indian, Maattrraan, Makkhi, Malayalam, Molly Aunty Rocks!, Movie, Niles, October 12, OMG Oh My God, Punjabi, Puthiya Theerangal, Regal Cantera Stadium 17, Saadi Wakhri Hai Shaan, South Barrington, Tamil, Telugu, Warrenville on October 11, 2012 by Kathy. Like its namesake confection, Barfi! is certainly sweet. Not a frothy sweetness but a complex one with real depth and substance. Barfi! is not to be missed. The film defies convention yet feels familiar. Flashbacks within flashbacks within flashforwards play with typical narrative format in a way that works better than it should. The bulk of the action alternates between two times and places — 1972 and 1978, Darjeeling and Kolkata — framed by scenes set in the present day. The film’s narrator, Shruti (Ileana D’Cruz), recalls how her life changed in 1972 when her family moved from Kolkata to Darjeeling and she met Barfi (Ranbir Kapoor). 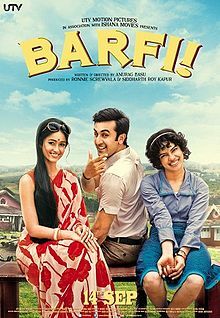 “Barfi” is how the deaf young man pronounces his given name, Murphy, so everyone calls him by his nickname. Unemployed Barfi spends his days making mischief around town, to the consternation of police inspector Dutta (Saurabh Shukla). Though he has a crush on Shruti, Barfi settles for friendship with her, because she is engaged. The two spend their days racing bicycles and bumming rides on train cars, falling in love in the process. In the hands of a writer-director less skilled than Anurag Basu, Barfi’s penchant for mischief could be a cheap way to substitute quirkiness for character development. That’s not the case here. Barfi acts like an overgrown child because no one expects anything from him. He’s the town’s beloved mascot, cared for by his doting father, but that’s it. Barfi’s outsider status makes a romantic match with Shruti impossible, even if she didn’t have a perfect-on-paper fiance waiting for her back in Kolkata. There’s no way her parents would accept a deaf son-in-law, even if the reason they give is their desire to spare her from the harsh judgements of society. Shruti herself fails Barfi’s loyalty test. She lets go of his hand and leaps from his side as a light pole falls toward them. Having doctored the light pole himself, Barfi knows they were never in any danger. Like others before her, Shruti abandoned Barfi at the first sign of danger. The one person to pass the loyalty test is Jhilmil (Priyanka Chopra), the autistic granddaughter of a wealthy local man. Having spent most of her childhood at a sanitarium — so as not to embarrass her snooty parents — she’s summoned to the side of her ailing grandfather. Barfi’s father is the grandfather’s driver, and Barfi and Jhilmil were childhood friends. Jhilmil’s parents are no less embarrassed by their now-adult daughter when she returns. Jhilmil shuns almost all physical contact, screams and panics when she gets mud on her shoes, and loudly sings along with the band at a society party. The only person in Darjeeling who warms to Jhilmil is Barfi. Caring for her gives him purpose, and he provides her with a sense of security. These themes — security and purpose — are universal, and those are the main challenges for Barfi and Jhilmil, not their special needs. Basu writes the characters as real people, not as a collection of physical and mental issues to be triumphed over. Shruti — the “normal” character among the three — is actually the most flawed, in that she lacks courage. D’Cruz, an actress who has predominantly worked in Telugu films thus far, is a fine avatar for the audience. She nicely portrays the conflict inside Shruti, who would like to follow her heart but lacks the will to do it. Ranbir Kapoor is the only actor who could have played Barfi. He has great physicality, both in scenes where he runs from Inspector Dutta (Saurabh Shukla is also great in the film) and where he bares his soul to Shruti using only gestures, no words. Kapoor makes Barfi more than just a lovable rascal. But the standout performance in the film is by Priyanka Chopra. I’ve long appreciated the risks she takes in the roles she chooses, even if they don’t always work out. Playing an autistic woman could have gone poorly, but Chopra is perfect. Like Kapoor, Chopra has very little dialog in the film. Jhilmil spends most of the time staring at the ground or observing the action around her, yet Chopra makes it easy to read Jhilmil’s emotions. Chopra’s depiction of autistic characteristics is accurate and respectful. Despite having a condition that makes forming emotional connections with other people difficult, there’s a lot to love about Jhilmil. Other things to love about Barfi! include the beautiful scenery and music. Transitions between scenes are frequently accomplished by a pan over the silhouettes of three musicians — a guitarist, a violinist, and an accordion player — who seem to follow the characters everywhere. Barfi! is a really special film. I laughed out loud, I cried, and I would happily watch it again tomorrow. This entry was posted in Reviews and tagged 2012, 4 Stars, Anurag Basu, Barfi!, Bollywood, Hindi, Ileana D'Cruz, Indian, Movie Review, Priyanka Chopra, Ranbir Kapoor, Saurabh Shukla on September 17, 2012 by Kathy.